Atopic dermatitis is a pruritic (itchy) skin disease of dogs and cats. In atopic dermatitis, an allergic reaction occurs when an animal inhales airborne substances (pollen, house dust) or ingests a substance to which they are sensitive. The allergic reaction causes the animal to rub, lick, bite or scratch. Unlike man, animals with atopic dermatitis only occasionally cough, sneeze or get asthma. Instead, they itch. The itching may be localized to certain areas or may be over their entire body. Usually the feet, face, ears, armpits and front legs are affected. This is in contrast to a flea allergy where the rump, tail, groin and thighs are usually affected. 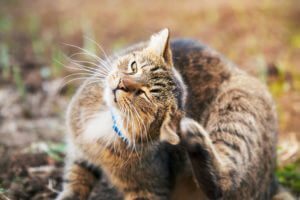 About half of the animals with atopic dermatitis will also be allergic to fleas and will have symptoms of both diseases. Atopic dermatitis due to food reactions can be cured, while those due to airborne substances cannot be cured, but in most cases can be controlled with medication. Usually, cortisone-type drugs (steroids) are used. They are very effective anti-inflammatory, anti-itch medications. However, steroids have more side effects (excessive drinking, urinating and eating along with increased susceptibility to infection) than other treatments. If used long-term without supervision, steroids may also decrease your pet’s longevity. Unfortunately, steroids may be the only treatment that will control your pet’s symptoms. If you do not want your pet on long-term steroids, or if they cannot tolerate them, there are alternatives. Antihistamines, in conjunction with essential fatty acids (EFAs), will control 10-25% of animals with atopic dermatitis due to airborne allergens. They have far fewer side effects (only grogginess) than steroids. EFAs work better in combination with antihistamines than either product alone. There are no side effects to EFAs, but they may take up to 60 days to be effective. These products, however, do not help pyodermas (bacterial skin infections), Malassezia infections (yeast infections), otitis externa (ear infections), cutaneous adverse food reactions or flea allergies. Allergen specific immunotherapy (ASIT) is the ONLY method that is currently available to help IMPROVE the health of the immune system (vs. masking symptoms). ASIT involves giving a series of injections containing specific airborne (not food) antigens (allergens) to which your pet is sensitive. In order to determine your pet’s SPECIFIC airborne allergy, intradermal allergy testing (IDAT) is performed. IDAT is a technique in which a small amount of allergens are injected into the skin. The skin is then evaluated for any reactions to determine which airborne allergens affect your pet. Once we identify the allergens, you can try avoiding them. However, in the vast majority of the cases (99%), avoidance does not work. ASIT makes it possible to desensitize your pet to these airborne allergens. About 60-70% of the cases of atopic dermatitis due to airborne allergens respond to ASIT (either needing no other medications or less potent medication than previously). ASIT stimulates your pet’s own protective mechanism (immune system), which stops or mitigates the allergic reaction. 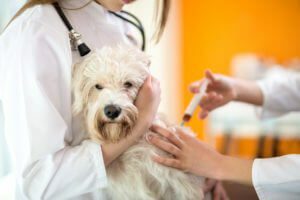 Injections must be given every 7-21 days for the LIFETIME OF YOUR PET. Because we must depend on the immune system for the allergy injections to work, it may take 6-12 months for them to be effective. 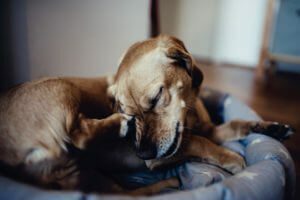 Animals with atopic dermatitis are prone to secondary skin infections, ear infections and Malassezia (yeast) infections and frequently have sensitive skin. Any skin infection, irritating substance, or fleas will aggravate the allergic condition and may cause flare-ups in controlled cases. For these reasons, flea control and careful bathing and rinsing need to be done on a regular basis. Antibiotics and/or antifungal medications may be needed to treat any secondary infections.